Here is a little recap of the day we met our girls! As you can imagine we woke up incredibly nervous and full of anticipation to meet our girls! We started the morning with a relaxing breakfast at what would become our favorite spot for coffee, Pan Pa Ya! Then, we found some beautiful flowers to give the girls when we met them. Because girls love to be given flowers ….right! Then we were ready to head to the orphanage with our bag of tricks and clothes for them to wear. Our agency gave us great ideas on what we should have with us to make the visit go smoothly. We had Skyped with the girls three times before this day, so they had seen our faces and interacted with us. When we arrived, the staff took the clothes we brought and got the girls ready to meet us. They entered the room with smiles but very cautious. As we have told many people before, this day was exciting but it also came with deep sadness. I can’t imagine what was going through their little minds. My husband speaking Spanish helped them feel so comfortable. He played with the oldest and I colored with the youngest. They LOVED the cookies and put stickers on all of the papers! After about 30 min. we asked if they were ready to go and the oldest grabbed my husbands hand and was ready to leave. This was truly a blessing! We had read and been told about a variety of responses children have when leaving their home. We were ready for anything but were overjoyed when the departure was so natural. After we left, not very long into our trip the littlest leaned over and fell asleep on me. This momma was loving every minute of it! Our first stop as a family was the mall. Yes, I said the mall. You see, this trip was filled with appointments and one of the things we had to get was a family photo. Our driver took us to the place she recommended and went in with us to help get the exact photos we needed. We were surprised to find out we would be taking our first family photo inside of a photo booth. Instead of a normal photo booth with an automated camera a man stuck his head through a curtain and snapped our picture. After one more stop for documents, we were ready to go home. We enjoyed dinner at home and had fun talking with the girls. The entertainment at the dinner table was the ice in the glasses. We had filled the glasses with ice like we normally do for guests however, we didn’t know that this was a new concept to them. They giggled and made crazy faces all evening with the ice. After our first dinner together, we got out the stickers and this kept us busy until bedtime! As you can see there were stickers EVERYWHERE!!! We started our bedtime routine and our oldest was excited to read the Bible. We were all exhausted and slept great! We had originally planned on staying up after the girls went to bed so we could discuss our game plan, however we just fell asleep instead. The day was a whirlwind but simply beautiful. A year ago, we were on our way to Colombia to meet our daughters. It was exciting and terrifying all at the same time. We felt great about how well our agency prepared us for the trip and we knew they were just a call away if we needed them in country. When I say they prepared us, I am not kidding!! I plan to give you a daily blog about our adventures in Colombia and you will see how our agency was almost like a family to us! While on the plane we enjoyed our last day together before becoming a family of 5. It was one of those moments that you laugh, cry, cling to your seat (oh…that was just me), sit in silence, sip on your coffee (which was ordered in Spanish thanks to my awesome hubby), watch the GPS of the plane and fall asleep from pure exhaustion. Like I said before, our agency prepared us for every step of this journey. So, we knew exactly what to expect when we landed. A plan is always great if everyone sticks to the plan. Our pilot didn’t get the memo about our plan and dropped us off to catch a bus into the airport. Although, that was a little strange, we just went with it. We knew that flexibility had to be part of the journey or we would be stressed every day. So off we went on a bus with people who did not speak our language! We arrived in the airport and found our driver. I have to admit it was fun having someone waiting there for you with your name on a sign. She was precious and we learned later that she was one of the most important people we would spend time with. As we road towards our apartment, we were able to see our first view of Bogota. It was amazing! I love when you arrive in a new place and are captivated by everything around you! We entered our apartment ( which we joked that the girls would be disappointed when they saw our home because the apartment was so NICE!) and like I said before, our driver was not only our driver. She walked us up, translated for us, and made sure we had everything we needed before leaving us that night. After she left we just sat in awe of the beautiful apartment that we would bring our girls home to the next day. 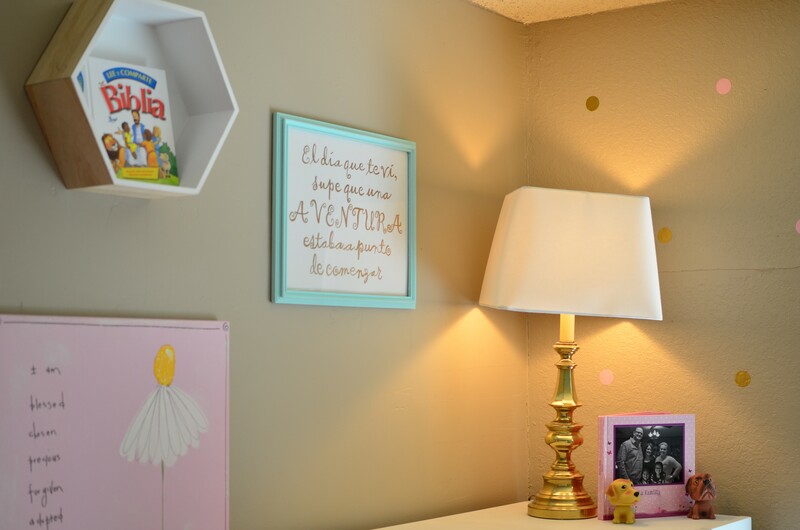 This is the fun part….the bedroom! First, I found an inspiration picture and went from there. I had colors picked out that were very soft. They were pink, brown, aqua, white, and gold. I wanted a soft relaxing space for our girls. It needed to be a special place. So, we have some amazing things added to this space that made it just perfect and unique for our girls. It is a very small office space with NO closet and did I mention there are girls living here! This was a huge concern for me so we are embracing the word SIMPLE! As we were waiting to meet our girls, we were able to send them a package. In the package we sent them each a doll. These dolls were the first real object they had from us that they started to bond with. They carried these dolls everywhere. These bears pictured below were just the perfect gift from our pastor! They have the year they were adopted on them. Also, I heard from a bird that he also picked out the clothes for these bears. Can I say that I love my pastor! He is definitely an example of loving people! They absolutely love all the animals they received at the airport! 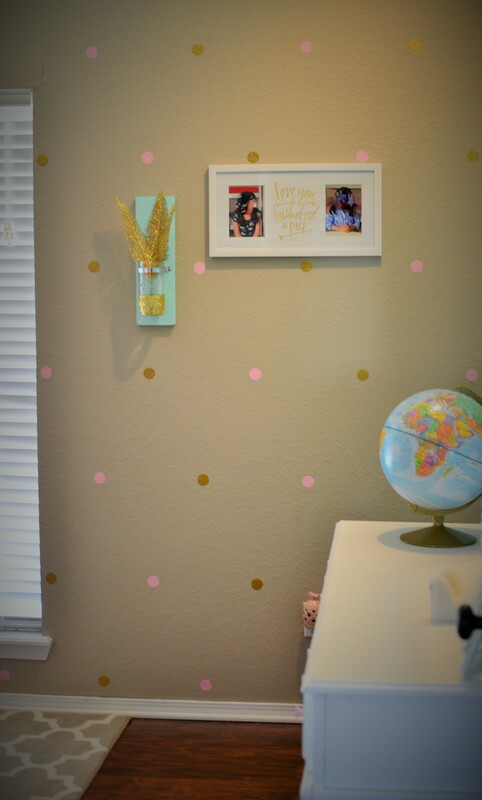 One of the things I loved about the inspiration picture was the polka dots on the wall. They added the perfect touch! They turned out amazing but we definitely had some frustration applying them. With my lack of wanting to measure anything and our awesome house that is not level….there were some challenges. Thank goodness for friends with a laser level and my husband! I had this wonderful vision of two twin metal beds…it was perfect in my mind. Then I had a reality check….this room could not fit the beds. 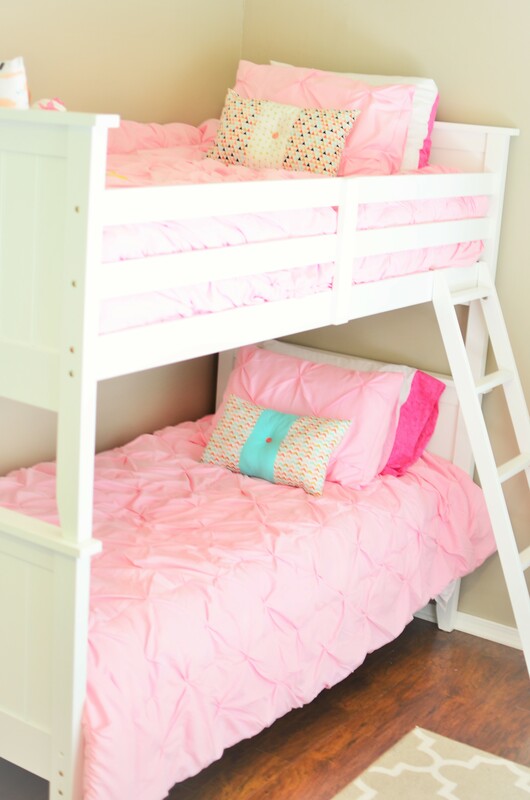 (insert some weeping here….I really wanted those beds) The best bed for this room was definitely the bunk beds. The search for bunk beds took a whole day. I wanted them to be sturdy yet affordable. We found a great deal and my family helped set them up! As soon as we found out we were getting girls, my sister-in-law started working on some beautiful quilts….and they are almost done!! The girls are going to love them!! And of course the quilts will make this space even more special! 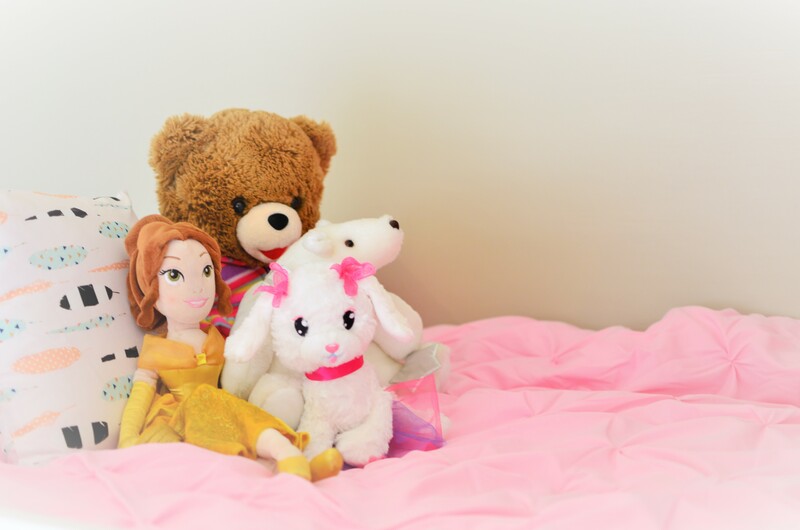 To add another touch of love for the girls, one of my friends added these pillows to put on their bed. The material is absolutely my FAVORITE!!! And I am sure these pillows are covered in prayers! 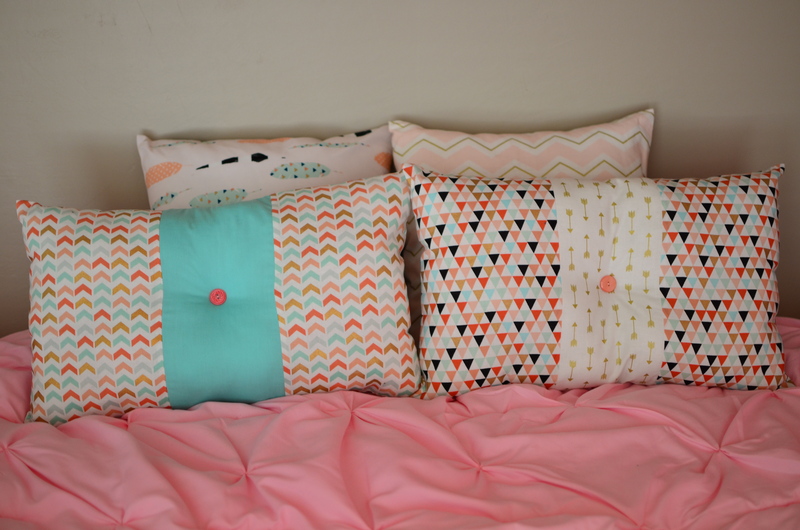 There are also two more pillows that are not shown here that they girls LOVE! 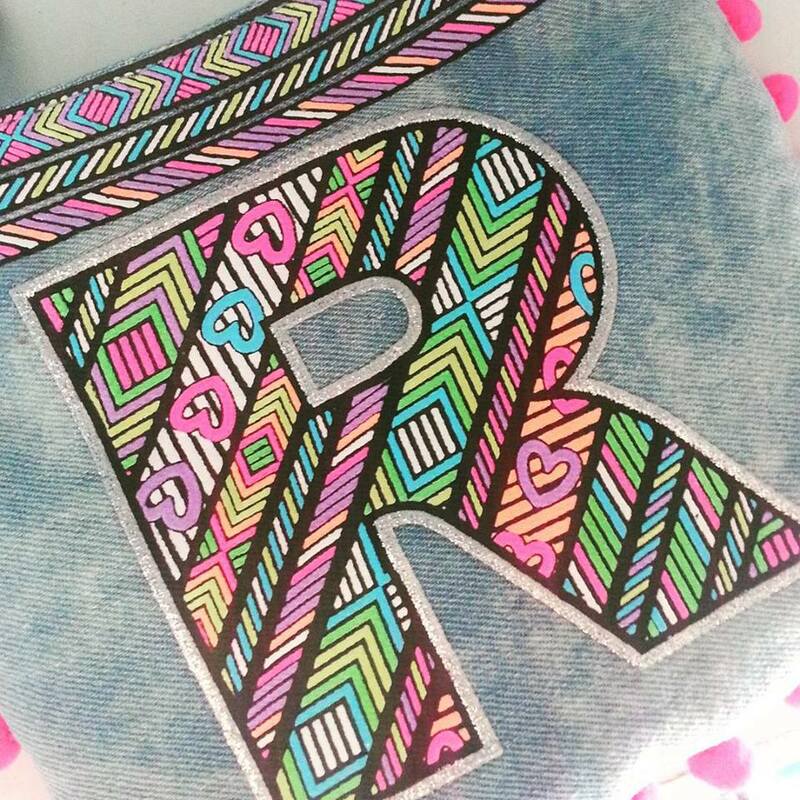 A sweet teacher friend made pillows with their names on them. They thought it was neat that they had a personalized pillow! 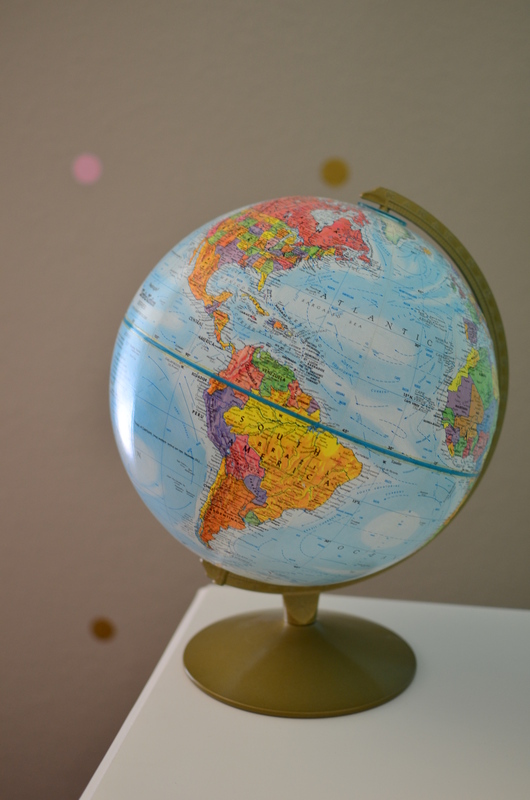 Globes are super popular right now… especially for adoptive families. I had no idea these things are so expensive! If you are adopting, money for accessories are pretty low on the priority list. So, I was beyond blessed to find out that our family had this globe from my grandpa. He also had the perfect gold lamp! In the Skype session the girls were amazed that it was a touch lamp. He passed away recently and I love that he is the light in their room and the reminder that the world is bigger than just where you live. These girls have big dreams and the world won’t hold them back! 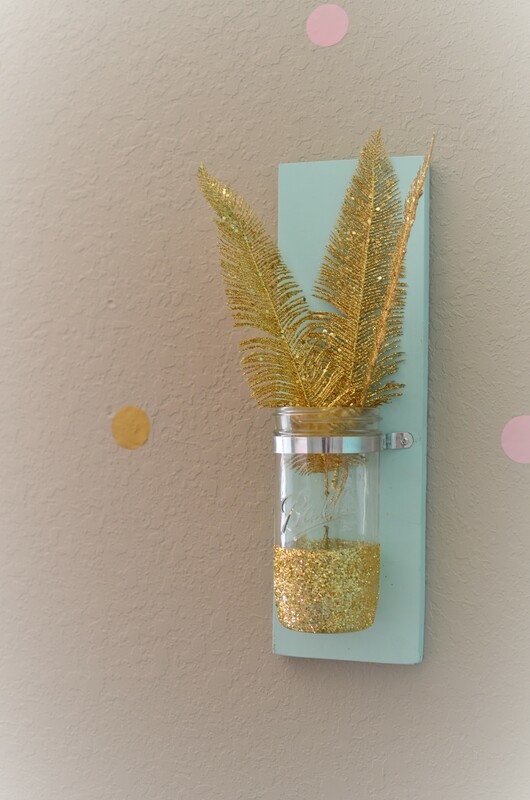 This flower vase was fun and easy to make! 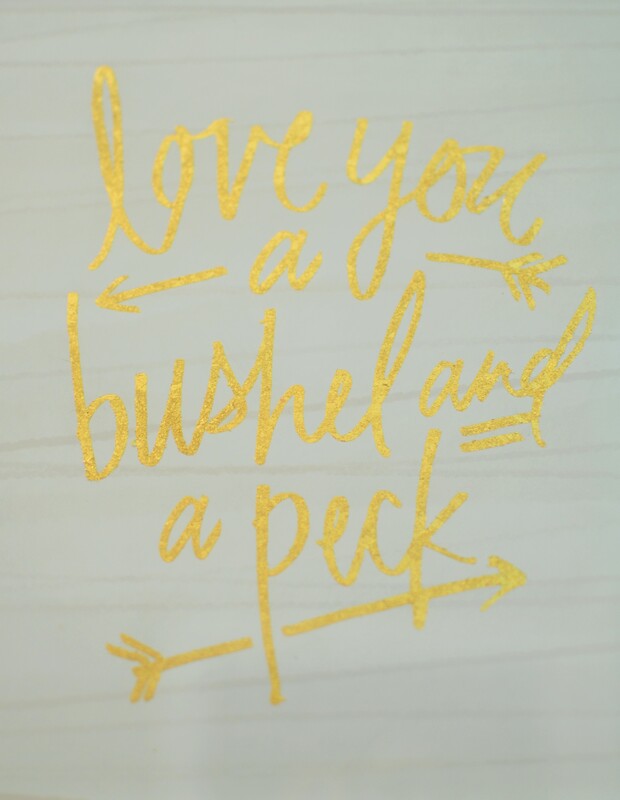 We had everything to make it except the feathers! Did I mention that there is NO closet……so every space is used for storage! We only had one picture of each of them before we left, so this frame was perfect. 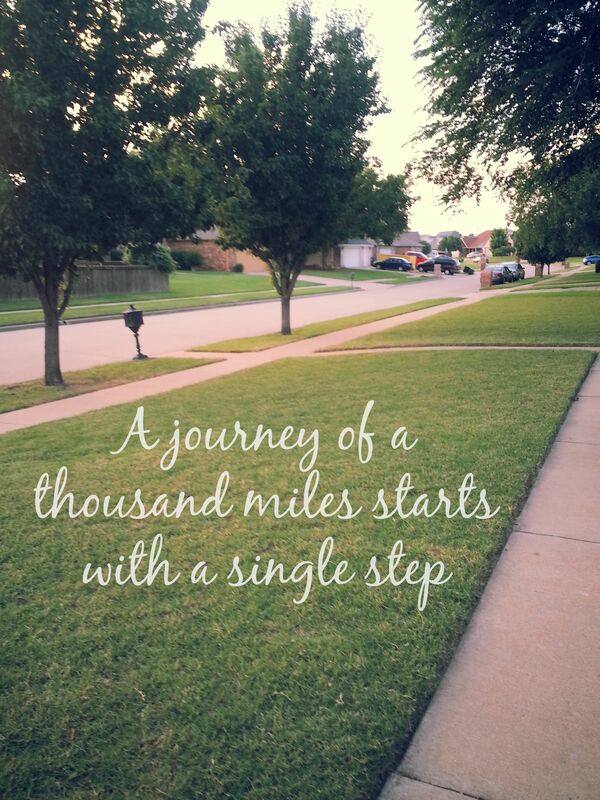 It had two places for pictures and the perfect quote in the middle…. 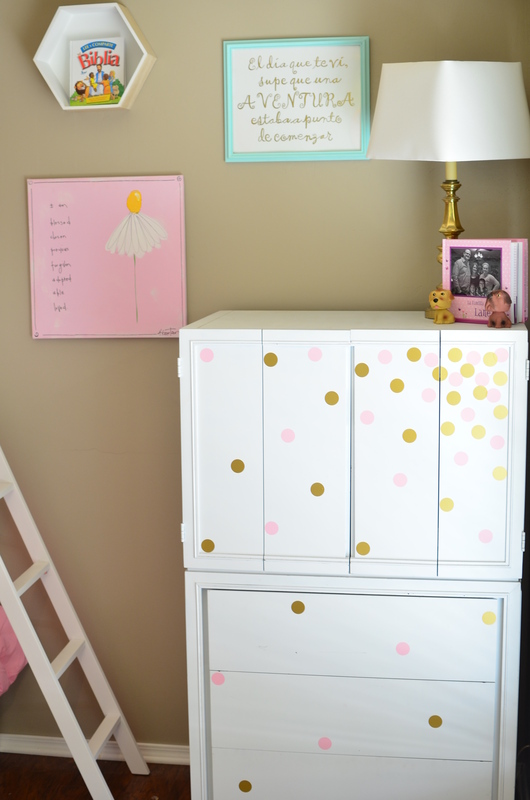 We all know that dressers are expensive and I love projects that turn old things into new! So, my mom gave us her dresser to paint. (insert into your mind a wooden colored dresser, because the before picture was deleted by my precious kiddos) This warms my heart every time I see it because it is a piece of my mom. It turned out beautiful! The handles are my favorite! Also, those frames on the dresser were made by my mom. She used Washi tape….you can use that stuff for ANYTHING!!! 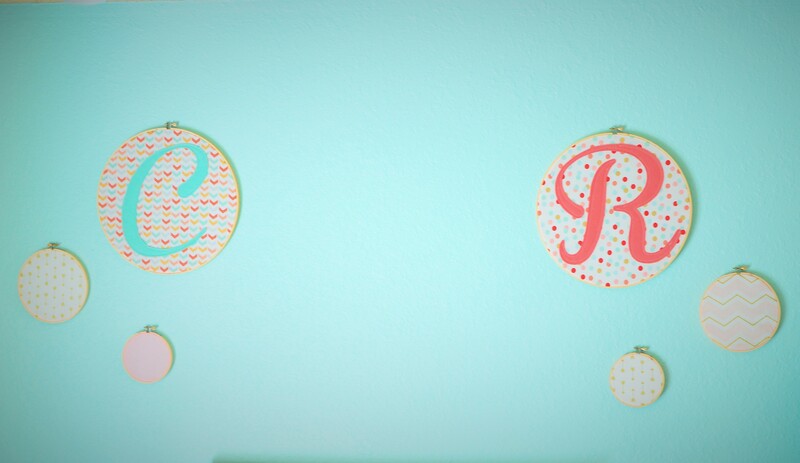 When we got matched I was overwhelmed with the fact that all of my friends are so crafty!! I love it. So, a friend from church wanted to help out and I had the perfect job that I needed done but couldn’t do myself. I gave her fabric and a little idea and she blew me away with her talent! While I was trying to find the perfect pieces to make the room work with our budget, I had this amazing friend blessing the socks off me! It was important that there was some Spanish artwork in the room and she made that happen. It was also important to me that the quotes were meaningful. I really wanted to have MOST of the room done before the girls came home. 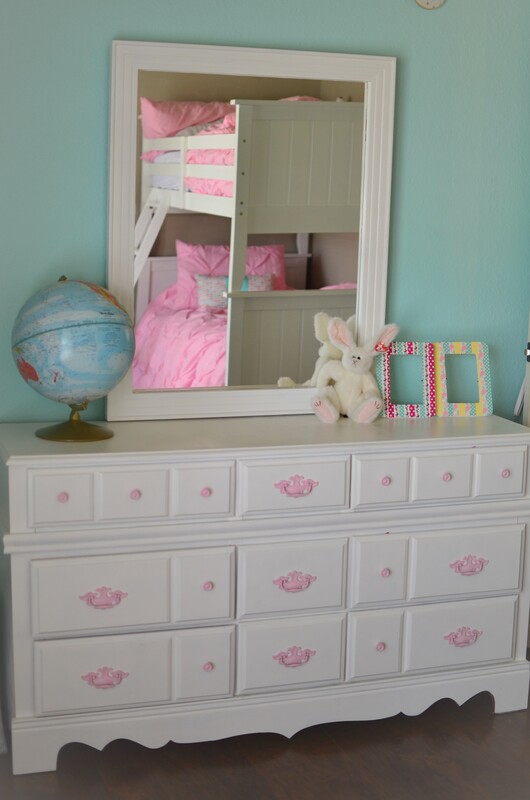 So, she came over late one night and finished my unfinished work….aren’t these polka dots on this dresser fabulous! I can not say thank you enough for her friendship. 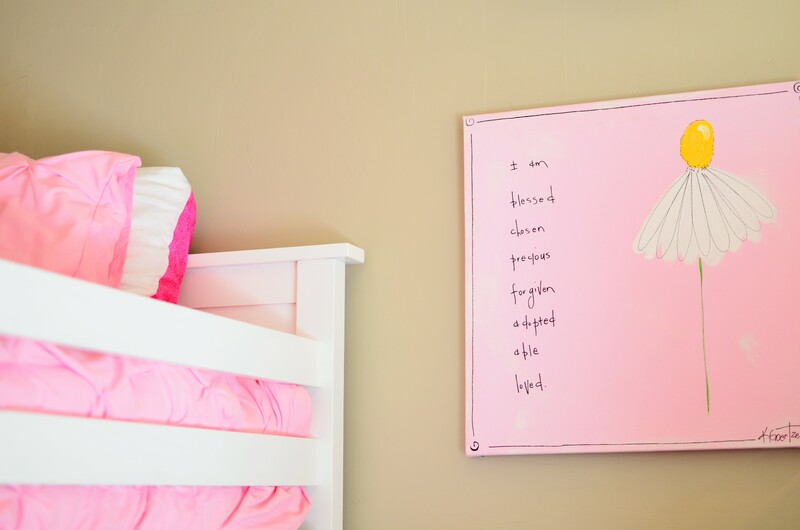 The girls love their room and I love that it has so many special things in it to show them they have so many people who love them. Thank you friends for making this space perfect…..and if I forgot to mention you, I’m sorry! There were just tons of you that were involved. I LOVE EACH ONE OF YOU! This adoption process is full of things to check off your list in order to get your beautiful kids home. You make your way through paperwork hoping it will go quickly. For me it hasn’t been emotional. I am just working towards a goal. When we got matched I was excited and a little part of me started realizing that this was really happening. My past experiences with so many miscarriages have really messed with my ability to become excited before something happens. Sadly, I think I have a little doubt when I should just be leaning on my strong Savior who has me in his arms. However, I am not perfect so this is the area of my life I am working on. 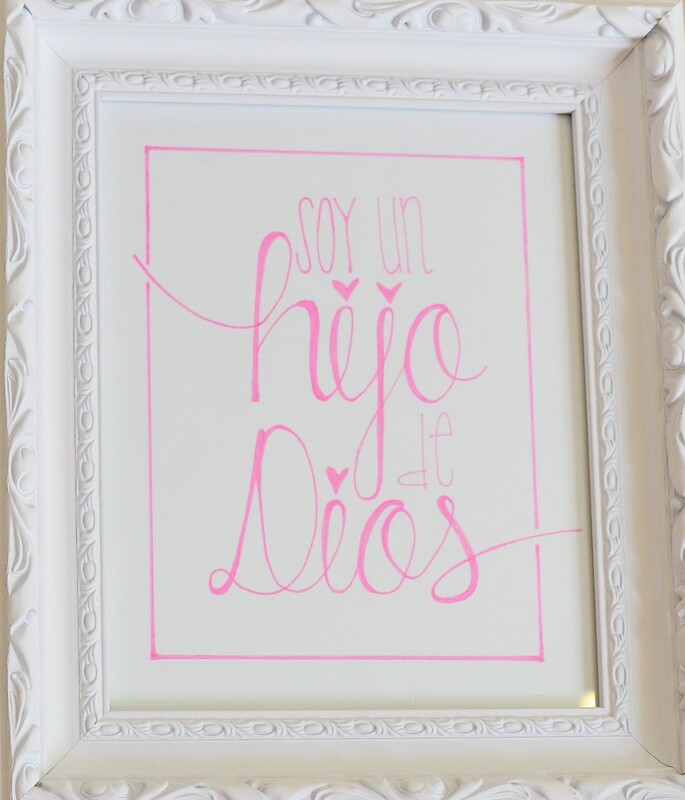 I wasn’t sure when it would kick in that this adoption was real, I was becoming a mom, and God had been preparing me for this. Just a few weeks ago my husband and I needed one more document before we traveled to Colombia to pick up our girls. We needed to get our Visa to travel to Colombia and have two Colombian citizens in our custody. We tried to get this done early however, they were closed. The best option was a little risky but why not! Our plan was to get our Visa the day before we got on the airplane. I already had filled out the application online, we just needed to show up, pay, and pick up the Visa. We woke up early and were the 2nd family in line at the Colombian Embassy. When it was our turn to pay we sadly found out that our application had expired. We had heard that this place was not very helpful because of how busy they are. So, immediately we called our case worker so she could forward some documents and get a new application filled out. However, while I was on the phone with her things changed. The wonderful women at the counter decided she was going to fill out our application and take our picture for us. Then, we tried to pay the fee with our money order and they had raised the price. This was a big deal because you can’t pay with cash….just a money order. However, again this precious women said she would take cash. This was truly God standing right there with us making sure this plan He had, was right on track! When we left, I was overwhelmed with this feeling….it was finally that feeling…we were ready to get our girls! It reminded me of a doctor’s appointment but instead of leaving with devastating results we were overjoyed! Adoption is not like being pregnant. The emotions are different and the bonding starts at different times. Although some things are very different from a pregnancy…… we are becoming parents! ~I have always been a person that really didn’t want to accept gifts. *I felt guilty that they were spending money on me. *I would always feel like I needed to pay them back or convey how thankful I was. This is so BIG! I wish I would have understood this early but hey better late than never! So, to finish my story I want to tell you about how our co-workers knew our heart and blessed the socks off of us. It truly could not have been more perfect! 💗 Late one night we had literally just hung up on Skype with our daughters. It was one of those hectic nights that dinner was not made and we had so much to do. Our oldest daughter had mentioned that we should just get pizza. That was the best idea ever! She said, lets just go get it. Well, that was a little odd because we usually called in the order before we left to go get it. However, she said, “just get out here.” At that moment I knew that something was going on. We went outside and nobody was there. I was looking around and then I saw it! Coming down our street was a huge group of people walking towards our house singing Jesus Loves the Little Children. Well, you guessed it….I lost it. Seriously, the best surprise ever! They came up and hugged us and each one of them had the perfect words for our heart. They were encouraging, funny, thoughtful, and some just had great travel advice. 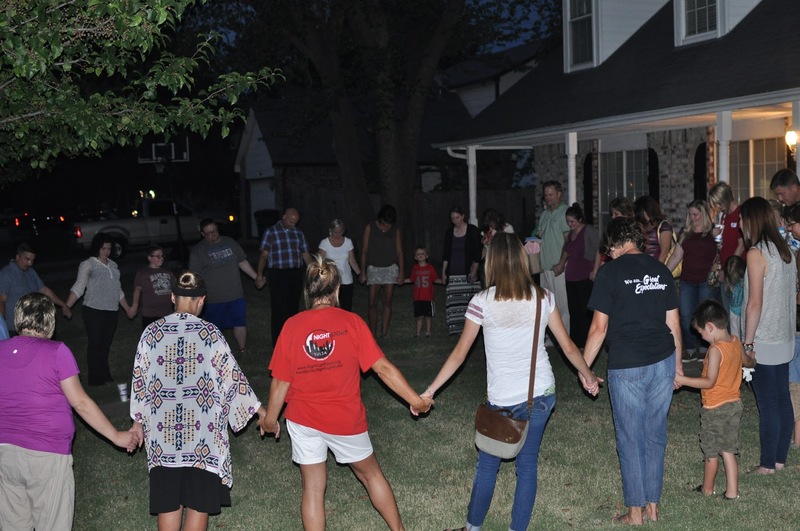 Then these sweet people know our family so well……we circled around our front yard (our girls new home ) and prayed over this journey that we were getting ready to begin. This post will not even convey how much this meant to our hearts. Seriously…I cried that night, I cry when I think of this, and yes…I’m crying right now. After most of the tears had happened …they blessed us with gifts and a huge ring of note cards with encouraging words we could read for our journey. This night was still, quiet yet full of life, and the perfect blessing during a crazy busy week. They each hugged and cried with us and then went on their way……and we said…..THANK YOU! I won’t be able to pay each person back or write thank you cards. I won’t be able to explain what each person means to me or tell them why their gift was perfect. However, I have learned that is not my job. I can say thank you and God will take care of the master plan and they will be beyond blessed for their generosity that night! You know I said at the beginning of this post that saying thank you was so important and God would take care of the rest…well, here is just one more story that will prove to you that blessing others will come back around and change your life. This picture melts my heart that these children witnessed this example of friends being there for each other. They will remember this night and will be changed by the example their parents set for them. One of the older boys shared his thoughts about this night with his mom and it left both of us speechless! It is proof that this journey we are on is NOT about us. Speechless…there is nothing more to say…God has great plans for you, friend! We are so excited to share this journey with you! We definitely are keeping a watchful eye to bless people and pay it forward. Here are some helpful tips we found out along the way when it was time to Skype with our girls! First, prepare! It is hard to just jump on the computer and talk with little kids in another language without some kind of loose plan. We would always get on about 15 min early just to check that everything was working. Second, find some program that works with your computer to record the skype session. We used QUICK TIME on the Mac. We also used a video camera to record our reactions.This is one of the best things we did! There are several reasons why this is so important. You can share it with your family! It is amazing how quickly you forget the little details so this is priceless! I just love that you can go back and see their sweet faces! There were questions that the psychologist answered so we had a way of remembering those important details. There were many things that we prepared to show them to keep the conversation going. Many of our friends and social workers helped us with ideas. One family even explained to us that since they had a photo book of us, it was like they were checking to make sure the things we were telling them were real. So here is a list that might help you get started! After several conversations we were seeking more questions to ask. The time you have with them is so special but after awhile it slowed down for us and we were having a hard time coming up with interesting questions. Everyone is nervous, so break the ice and sing a song, read a book, or play Simon says! Do you like fruit, candy, or veggies? Do you play with baby dolls? Tell them about your weather? I am so thankful for the opportunity to use Skype to meet my girls. 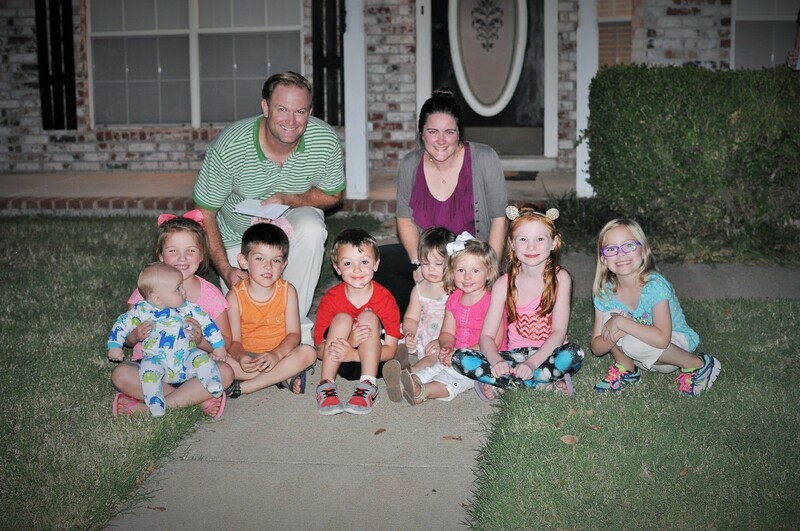 This is such an incredible way to start the transition process for our family. There are so many emotions that they can start processing because we have had several conversations. Well, we are anxiously waiting to Skype with our girls. We keep doing paperwork after paperwork to get things moving but we have a little snag in the process. You are required to Skype with the children. They need to meet us before we arrive to pick them up. I mean really think about it….kinda scary! So, it is important that we Skype with them, so they can meet us and start processing the fact that they have a family coming to get them! It is easy to say that this is so exciting….and don’t get me wrong…it is…but it is also very emotional. So we are praying that when they find out, they have time to process what is happening and have that feeling of peace. So, the reason we have not Skyped yet, is because one of them has the chicken pox. They have to be really careful with her because she has been contagious and there are many children there that could get it from her. So, that being said, please pray that she is healed and we get to Skype next week with them. After that happens ….things will be moving quickly! I know that God has perfect timing and He is our healing…so join in standing in agreement that she is healed and they come home soon.